A passenger train after a collision with a landslide, near Vacarisses, some 45 kilometers northwest of Barcelona, Spain, Tuesday Nov. 20, 2018. One person died and dozens were injured Tuesday after a landslide derailed a commuter train traveling toward Barcelona, Spanish authorities said. 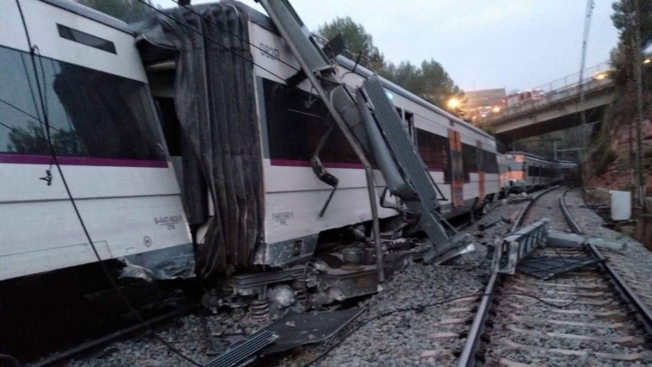 One person died and dozens were injured Tuesday after a landslide derailed a commuter train traveling toward Barcelona, Spanish authorities said. The regional civil protection agency said that two train cars of a convoy of six came off the tracks at 6.15 a.m. local near Vacarisses, some 45 kilometers northwest of Barcelona. Firefighters and emergency workers evacuated 131 commuters and sent five of the 41 people injured to hospital, according to the civil protection agency. Spanish railway operator spokesman Antonio Carmona told local media that heavy rain in the area over the past few days could have caused the landslide. Recent downpours have battered Spain. A woman died Sunday after a river flooded its banks in the northwestern Galicia region. And on Monday, huge waves swept away the balconies of a sea-side apartment building on the Canary island of Tenerife. The heavy rains have also caused travel disruption and damage to farmland across the country.